I’m not a huge sausage fan (there’s a joke in there somewhere) but this dish really surprised me because I liked it so much!! 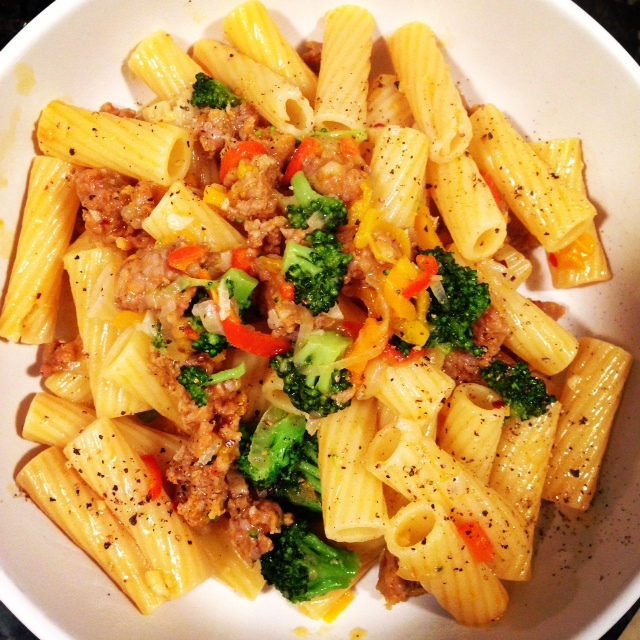 The sweet mini peppers sautéed with garlic and onions offset the spicy, crumbled Italian sausage and the broccoli gave it a little extra crunch and nice contrasting touch of color. It was divine and so easy to make! You can make this with other pasta types, perhaps farfalle or even fusilli, but personally I’m a huge fan of rigatoni and that’s what I had on hand. I would have liked to add a touch of dry white wine but I had none so I substituted chicken stock instead and it still turned out great! Like most of my pasta dishes, this one doesn’t technically have a “sauce” but the oil from the sausage combined with the chicken stock creates a piquant (but not overly greasy) liquid that coats the pasta. It’s delicious! This dish will certainly be a hit for the whole family–try it out tonight and let me know! Over medium heat, heat 2 tbsp of extra virgin olive oil and add onions. Cook for 3-4 minutes, or until they begin to turn shiny and translucent. Add the garlic and peppers. Cook for a minute. Add the chicken stock. Cook for another 5-7 minutes until the peppers start to soften and the liquid evaporates somewhat. “Tear” apart the sausage into the pan. Cook until sausage is cooked through. With a wooden spoon break up the big chunks of sausage. I added some more olive oil to create more of a sauce. The olive oil became flavored by the sausage! The chicken stock should cook down but not completely dry out. If needed, add more stock. Add the broccoli for the last 3-5 minutes of cooking. Taste and add salt/pepper if needed. The sausage is pretty salty so you most likely won’t need much. Cook according to the directions on the box. Combine and top with freshly grated parmigiano or romano cheese! Drizzle with some more olive oil before serving.